Easy height adjustment on the frame allows seat height to be adjusted from 18" to 22" in 1" increments. Comfortable, wide, seamless padded seat with zippered pouch under seat for security of personal items, also includes black pouch for storage of larger items. Ergonomic handgrips offer a comfortable grip and adjustable handle height with knobs to secure in place. The Lumex Set n' Go Height Adjustable Relator offers the convenience and flexibility of a two-in-one product all rolled into one. 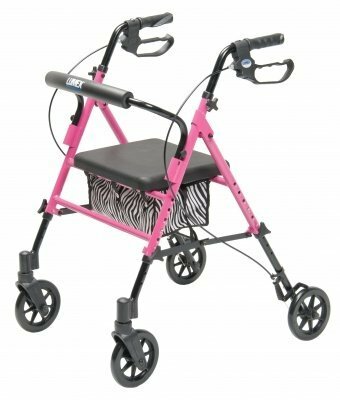 Designed with multiple height settings on the frame, the Set n' Go allows the seat height to be adjusted from a hemi 18" to a standard 22" height in 1" increments. This accommodates for a broad range of user heights which in turn offers more comfort for the user when seated. Easy to operate locking and "quick stop" loop brakes (pull up to stop; push down to lock). Removable padded back bar with easy release pull knobs. 6" wheel for both indoor and outdoor use. 300 lb. maximum weight capacity.